5:42 AM Amnesia, Health, Health Benefits, Health care., Home Remedies., Treatment. Amnesia is an intense memory Memory loss or sudden discomfort or pain in head makes a person uncomfortable loss which is usually caused by either physical injury to the brain or by intake of toxic substance that affects the brain. Memory loss can be due to psychological factors like trauma or emotional event. 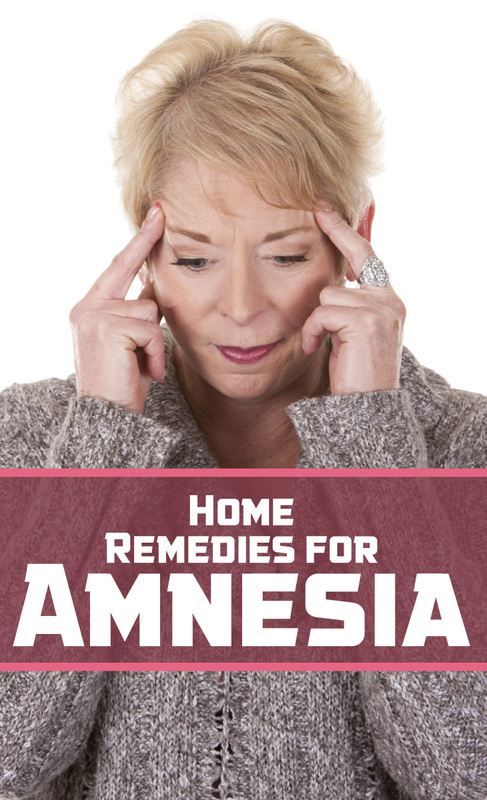 Amnesia natural treatment has proven to be beneficial in alleviating its ill effects. The person suffering from amnesia has difficulty in learning new things, they are confused and/or they have difficulty to recall previous information or events. Causes for amnesia include health conditions such as brain tumor, hysteria and seizure, meningitis, as well as degenerative brain disease like Alzheimer’s. Symptoms of amnesia can be seen in both men and women, and can occur at any age. These can be experienced as partial or total memory loss, inability to recognize familiar, uncoordinated movements or tremors, inability to recall past events, confusion or perplexity, problems with short term memory. The natural remedies are very beneficial in improving mental awareness and also to boost the nervous system. Here are some of the effective and economical remedies for amnesia. The most significant remedy for memory loss is the use of the rosemary. By taking rosemary tea once or twice a day will help you to treat the problems of forgetfulness. It is considered to be an antidote for mental fatigue. Use of Indian pennyworth is very advantageous in treating forgetfulness. Grind dry seven grams of Indian pennyworth, seven kernels of almonds and half a gram pepper. Add water and sugar in this mixture. Intake of it on an empty stomach every morning is effective. Sage herb is helpful in treating amnesia and also strengthens the ability to concentrate. A tea prepared from dried sage seven leaves can be consumed regularly. About ten to twelve almonds must be soaked into water overnight. Prepare a paste by removing its brown skin and adding one teaspoon of butter, can be consumed daily morning. With a teaspoon of honey add five seeds of ground black pepper and take it daily. It is a wonderful remedy for amnesia. Walnut is another unique dry fruit valuable in countering brain weakness. About twenty grams of walnut should be taken daily; it would be more beneficial if taken along with figs or raisin ten grams each. You can also use holy basil leaves (Tulsidas). Boil some leaves of holy basil in water and drink it. It has proved beneficial in improving memory. Apple contains various substances such as vitamin B1, phosphorous and potassium. Eating an apple with one teaspoon of honey and a cup of milk is beneficial in treating loss of memory and mental irritability. Cumin seed is one of the best home remedies for amnesia. Three grams of black cumin seeds with two teaspoon of honey, consume it daily once in the morning. Consuming cow’s milk and foods rich in phosphorous prove beneficial for amnesia. Relaxation and meditation techniques can fetch positive results in your pursuit for amnesia relief. As the above remedies and amnesia natural treatment are safe and easy to use, they can prove helpful for an amnesia patient.